Kite Park is not only a training center on the Hel Peninsula, but also an all-year base for kitesurfing trips and courses in the most incredible spots in the world. We visit some destinations on a regular basis, but we’re still searching for new ones, trying to meet our customers’ expectations (see Our destinations). Our offer stands out with individual approach to each participant. We don’t arrange cramped tours and we don’t stop at organizing accommodation and flights only. We care about our clients all the time, offering valuable tips and constantly watching their safety. During Borsuk PRO CAMPS with the 7-time Polish Kitesurfing Champion Victor Borsuk we coach kitesurfers at any level of advancement – from beginners to freestylers. In order to provide complex kitesurfing services, in our center you will also buy the necessary equipment and accessories. Kitesurfing unites us. We ride together and we also have fun together. Our client base, which is constantly growing, is made not of anonymous kitesurfers but people who sometimes become our good friends. We meet not only on trips, but also in Warsaw, where after each trip we gather to watch pictures and videos. Kite Park is a guarantee of a memorable kitesurfing trip: with interesting people, in the most fascinating spots in the world, in the atmosphere of common passion and excellent fun. This is where you come back! Brazil and the Sunset Coast as well as its further part up to Piaui state is one of our favorite destinations which we organize every year around October and November. We take small groups, up to twenty people, as it is the most optimum number to travel by 4x4 trucks. Equipment on the back of the car and here we go for a ride among wilderness and wide sandy beaches of this vast country. The emotions are unforgettable! We visit different reliable spots mostly dominated by kitesurfers, untouched beaches without a kite base or supervision and not yet crowded. They offer perfect conditions for wave, down winds, or freestyle during safe side onshore wind, which is steady and calm. There is also flat water for beginners. Generally, there is vast space, lots of sun and really strong winds (over 25 knots), much swimming, but also breathtaking views, lovely fishing villages and unique towns, delicious food and hot climate in the rhythm of samba and forro. We recommend this destination mostly to experienced kitesurfers who crave for more sport, love adventure and are not afraid of traveling. Every year we are also accompanied by beginners who make unbelievable progress. Non-kiting partners who would love to have some rest will also be satisfied. We take participants on the cruise across waters of the Red Sea on a motor yacht (three decks and several two-person cabins with bathrooms). We reach uninhabited little islands with blue bay water, where we swim and kitesurf. We sleep practically moored to the spot, so we ride from dawn till sunset, when the wind calms, then we dance on the deck after a nice nap. We eat buffet courses prepared by the crew on the yacht. It doesn’t shake during stops and only when a mooring place is changed may require taking appropriate drugs for people who suffer from sea sickness. We recommend this journey to everyone who want to have something to do with kitesurfing. Wild spots with insurance inflatable boats will satisfy both beginners and exquisite kitesurfers. 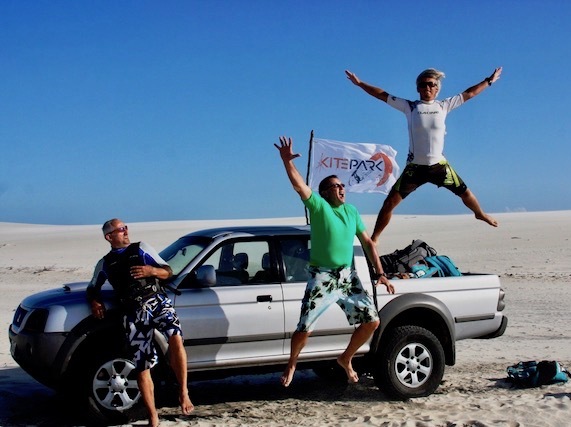 Kite Safari means a lot of kitesurfing and good fun! The second spot is Phan Rang, which attracts people with very wide and shallow bay with a long, yet narrow beach. On the barrier reef, long way from the shore, there are perfect conditions for the wave. There’s something for everyone – both beginners and advanced kitesurfers. Unfortunately, tides limit the time you can spend on the water. We also suggest taking booties as a protection from sharp rocks. On the spot there is a kite school and a bar with delicious Pho soup. Although the landscape isn’t particularly stunning and you have to commute with motor scooter (great fun! ), kitesurfing conditions are one of the best we have experienced during our lifetime journeys. The catamaran journey across the Grenadine Islands is one of the best trips we’ve experienced so far. This place was a set for the movie “Pirates of the Caribbean”. Mysterious, pristine, exotic, full of colors and scents! Besides, you will find bays with flat, breathtakingly transparent water, white beaches with tall palm trees bent towards the water, or juicy-green islands. Every travel agency would be proud of such landscapes, yet there are hardly any tourists, most of who are sailors. Kitesurfing here is extraordinary, not only because of the scenery. You launch from little patches of land or from catamaran’s deck. The place for a night break is chosen depending on wind direction ,therefore day’s plan is adjusted to kitesurfing sessions. And on the land you will find delicious food, reggae climate, and the famous rum! Venezuela is a destination which has been in offer for a while. You can visit three completely different spots: famous windsurfing-kitesurfing El Yaque on the Margerita Island with advanced infrastructure on land (base, stores, restaurants, and hotels of not really high standard though); El Coche – an island with large touristic all inclusive hotels located just by the water, a place definitely more quiet than El Yaque; and most of al all heavenly spots on the uninhabited islands of Los Roques National Park, where shallow and crystal clear water surrounds the white sandy beaches. All three places are perfect for kitesurfing but not at all advancement levels. For beginners we can certainly recommend Los Roques. It is good to feel three different climates: from surfer beaches with international visitors, through riding off shore just in front of a comfortable hotel, finally to motorboat trips to idyllic, completely deserted spots lost somewhere between Caribbean atolls. Our favorite place is Los Roques archipelago, but a journey to this spot is one of the most exclusive destinations, meaning: expensive. The expedition is recommended to all kitesurfers and their non-kiting partners, who would love some relax on the beach. The Prasonisi spot on the island of Rodos in Greece needs no special introduction even to those who have just started their adventure with kitesurfing or windsurfing. It is a very recognizable place. A tavern, several stores, modest guesthouses, as well as three water sports centers (including two Polish bases) on the pebble and sandy inlet offering wave on the one side and flat on the other side. In peak season the water is full of wind and kitesurfing lovers who enjoy the perfect infrastructure and great wind forecasts. We prefer to avoid crowds of people, so we use the spot in less busy times. Bardzo egzotycznie brzmiąca destynacja – afrykańska wyspa należąca do Tanzanii. Spoty w okolicach turystycznych zupełnie nieprzygotowane, bez asekuracji. Gdzieniegdzie szkoły w postaci dwóch instruktorów i drewnianej budki na sprzęt. Niewiarygodnie wysokie pływy, hodowle alg na patykach wbitych w dno, jeżowce, czy łódki rybaków stanowią spore przeszkody w uprawianiu kitesurfingu, jednak bardzo ciepła woda i komfortowy hotel nad samym akwenem wynagrodzą niewygody. Miejsce bardzo malownicze i kiedy wieje wiatr podczas przypływu przyjazne dla miłośników kite’a. Uwaga: wieczorem silniejszy wiatr wieje zawsze do brzegu, kiedy jest również największy przypływ. Polecamy wszystkim kitesurferom z osobami towarzyszącymi. Zanzibar to nie kierunek dla zapaleńców kite’a, pragnących katować na spocie bez przerwy nowe tricki, ale raczej dla tych o duszy podróżników, którzy chętnie zaliczą kolejny spot, a do tego w tak egzotycznym regionie. Nauka od zera jednak nie należy do najprzyjemniejszych ze względu na silne pływy, kierunek i niepewną moc wiatru oraz podwodne przeszkody. Heavenly oasis situated by the Red Sea, designed by the author of Eurodisneyland. El Gouna, also called “the Venice of Africa”, seduces not only with rich nightlife in clubs or restaurants in picturesque marina, but most of all with a sandy beach with shallow, turquoise lagoon. Mecca for many kitesurfers, regardless of the level of advancement. In the northern Mangroovy beach you will find our fellow Polish professional kitesurfing base, which offers comfortable infrastructure. A perfect spot for kitesurfing. Extremely comfortable kitesurfing! Five-star hotel just next to the bay with water area supervised by German windsurfing & kitesurfing center. No transfer needed – just a short walk towards perfectly arranged spot with shelter, bar, music, air compressor, beach boys and supervision! The bay is divided into wind and kite zones. Large surface of flat, knee-high water unfortunately goes away with low tide. The most common is the southern onshore wind. We recommend this destination to absolute beginners as well as to whole families with kids who will certainly appreciate the hotel pool. Those more advanced participants will enjoy the convenience of this good spot and fine water. Boracay was hailed as the most stunning island in the world, according to international 2012 poll carried out by the exclusive travel magazine “Travel & Leisure”. Sandy, long beaches, warm and sky-blue water, high air temperature and intensive nightlife attract tourists and water sports lovers from all over the globe. On Boracay you will find the famous White Beach with heavenly sand which remains cool despite tropical sun, as well as other beaches full of gorgeous sea shells thrown by the ocean. At night visitors may explore the nightlife in numerous clubs, bars and restaurants, where there’s something for everyone. The most popular for kitesurfing is the Bulabog beach, situated in the central part of the island. This is where we recommend staying. The bay is surrounded with coral reef so during high tide a huge body of shallow and flat water is created. Advanced kiters can test their skills riding waves a bit further away. Note: the wind blows onshore, so there’s not much space to land the kite during high tide. In the vicinity there are other picturesque spots which you can access by a motorboat. On the south of Sardinia a group of fellow Polish people run SKY HIGH, a wind & kite center. The atmosphere is fantastic: easygoing approach, passion for sports and the feeling of total relaxation. The service is exceptionally nice and professional, the food in the restaurant highly recommended and there are dancing parties until early morning. The center itself is located quite far away from accommodation and the spot (transfer by bus, transport of equipment). Large reservoir stretches along a kind of sandy levee with sand in the launching spot and bushes further down, on the low cliff. The side-shore wind and quite shallow water with sandy bottom allow for the beginners to just flow along the shore where walks the teacher, connected to the student by a radio. Later trainees come back to the launching spot – over and over again, until they learn how to ride upwind. Advanced kiters have the whole vast bay to themselves, unfortunately with a strong wind with chop. The school provides assistance with a jet ski. The wind is very unpredictable, a real lottery. Luckily, an hour away from the spot, on the storage reservoir, awaits a little nice cable park and a motorboat for wake surfing. The place may not have the perfect kitesurfing conditions, but the climate is so good it makes you want to come back. We recommend it to everyone who loves sports and would like to visit a beautiful island on the Mediterranean Sea.